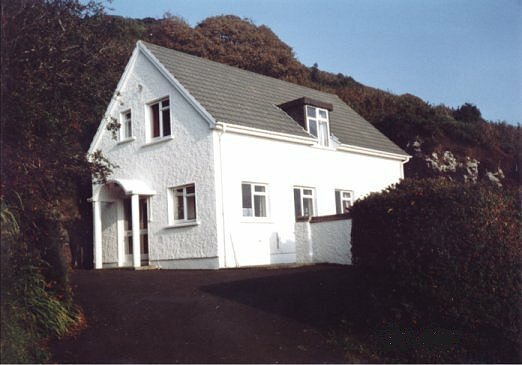 The School House is a two storey house, built on the unique site of a former National School, on the side of a steep hill overlooking Trawbreaga Bay. It faces south and west across to Slieve Snacht, 2019ft. and the Clonmany Hills. Half a mile to the west is the entrance to the Bay, and Five Fingers Strand  one and a half miles of sand and sandhills on the Atlantic. The house was rebuilt in 1972 on 50 acres of private land, in a special area of conservation, and has its own small garden which is surrounded by large outcrops of rock, heather, gorse and hazel bushes. Accommodation consists of entrance hall, with hot press and immersion heater, cloakroom with basin and w.c.
Large living/dining room, 23 x 17ft with french windows on to patio, and large hatch into fully equipped kitchen with electric cooker, fridge, larder etc., T.V in living area. Upstairs, one double bedded room, one twin bedded room, and one family room with two beds and two bunks. Separate bathroom with shower, bath, basin and w.c. Eight people can be comfortably accommodated, and there is a settee bunk and studio couch in the living room. The house has oil fired ducted warm air heating and also a large solid fuel Hunter stove in the living room Electricity is charged by meter  NOT SLOT. Oil by litres. The house is equipped with blankets, pillows, cutlery, crockery and utensils, but NOT LINEN. Tenants bring their own sheets, pillowcases and towels. Tea towels are supplied. Linen is available at extra cost. Malin village, one and a half miles east, can cater for daily needs, but there are many more shops in the market town of Carndonagh, 6 miles . Mrs. Vivien Holt, Goorey Lodge, Malin, Co. Donegal. Eire.